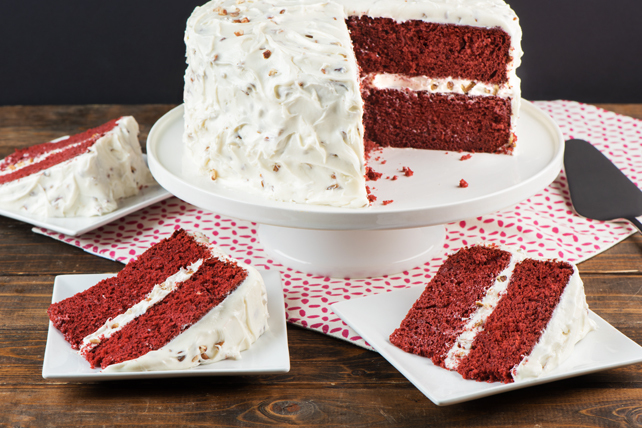 Red velvet cake is a celebration mainstay of the South and now, everywhere else. What makes this version so tantalizing is the smooth cream cheese frosting. Prepare cake batter and bake as directed on package for 2 (9-inch) round layers, adding melted chocolate and food colouring to dry cake mix along with water, eggs and oil. Cool cakes in pans 10 min. Remove to wire racks; cool completely. Beat cream cheese and butter in large bowl with mixer until blended. Gradually add sugar, beating well after each addition. Stir in nuts. Fill and frost cake layers with cream cheese frosting. Savour a serving of this classic special-occasion dessert that's the perfect dessert to serve at your next party. One cake makes enough for 16 servings.